Site Map will give you a clear idea about this blog. It will help you to understand my site and navigate it easily. Please spend some time here. You can click the pages link to go directly or just use the right page menu. Let's start..
A short discussion about the natural beautiful country Bangladesh. Dhaka is the capital of our country. It's a mega city and one of the important city of South Asia. It's also the 9th largest cities of the world which is densely populated. About 12 million people lives here. Panam City, Bangladesh Folk Arts & Crafts Foundation, Folk Art Museum, Hajigang Fort, Banglar Taj Mahal, Razmoni Pyramid etc. Tomb of Pari Bibi, Lalbagh Masjid, Hammam Khana (bath house) & Audience Hall of Governor (Diwan-I-Alam) etc. This is my school. More than 100 years old. It was established in 1904 by the British government in Armanitola, Dhaka, near the Famous Tara Mosjid (Star Mosque). Nature Observation Center, Parrot Aviary, Crown Pheasant, Hornbill Aviary, Macaw Land, Small Bird Zone, Fancy Duck Garden, Fancy Carp Garden, Crocodile Park, Ostrich Garden, Ligerd Park, Primate House, Elephant Zone, Watch Tower, Giraffe Feeding House, Marine Aquarium, Orchid House, Butterfly Garden, Hanging Bridge etc. Dhaka is situated on the bank of river Buriganga. Buriganga River (Old Ganges) flows past the southwest outer edge of Dhaka city. Book Fair of immortals of the 21st February also known as Amar Ekushe Boi Mela. It is the national book fair of Bangladesh. This event is dedicated to the martyrs who died on 21st February, 1952 to establish Bangla as the state language of East Pakistan. It is the palace of the Dhaka Nawab family. This magnificent building is situated in Waiz Ghat Bazar (Kumartoli), Old Dhaka along the bank of Buriganga River. The Iftari in Old Dhaka keeps it's tradition for a long time. Before the Maghrib prayer all the roads of Old Dhaka becomes crowded by the Iftari sellers. Specially the Iftari of Chawkbazar is well known to all over Bangladesh for it's distinct appeal. Chittagong considered as commercial and industrial capital of Bangladesh. 2nd largest city having the largest international seaport of the country. This port handling about 90% of the countries international trade. This is the only Railway Museum in Bangladesh that started in November 15, 2003 on a two storied wooden building. Hanging Bridge, Kaptai Lake, Hill Tracks, Shubhalang Waterfall, Sorgo Chera, Borkal Upazila, District Commissioner House etc. Seven Heaven, Holy Bell etc. Places we see: Cox's Bazar, Inani Beach, Moheshkhali, Adinath Temple etc. It's a small island only covered by 8 square kilometers of area. Some people call it Narical Jinjira, means Coconut Island. Chera Dwip and Daruchini Dwip is a part of this island. It's the only coral island in Bangladesh. From Chittagong this is the nearest Sea Beach and the best nearest open space where people can spend some good time. Potenga Beach, 22 km south from Chittagong, is a popular tourist spot. The beach is located at the Karnaphuli River mouth and stretches across the Bay-Of-Bengal. To prevent erosion some part of the sea sore is built up with large blocks of stones. Foy's Lake is an artificial lake constructed over 136.4 hectare area surrounded by hills in 1925. It's about 91 meters high above the sea level. We can divide this in three sections. 1. Amusement World, 2. Resort and 3. Sea World. There are almost fifty rides and a big Ferris wheel. Foy's Lake Resort where you can stay and enjoy the natural beauty. Sea World is a water them park consist of pools, water rides and a resort hotel. Khagrachari is a district under Chittagong Division located in the South-Eastern part of Bangladesh. The entire Chittagong Hill Tracts is divided into three circles. They are Mong Circle, Chakma Circle and Bomang Circle. Khagrachhari belongs to the Mong Circle. God decorated this place with immense beauty. Everywhere your eye can see is full of green. Sajek valley is famous for its exotic natural beauty. It is known as the Queen of Hills and the Roof of Rangamati. This valley is located in the middle of the mountains of Kasalong range in Sajek union, Baghaichhari Upazila in Rangamati District. Bandarban district is in the south-eastern part of Bangladesh under Chittagong division. It’s the largest Theravada Buddhist Temple with the second largest Buddha sculpture in Bangladesh. Nilgiri Hill Resort is located about 47 km south-east of Bandarban. It's the highest Hill Resort in Bangladesh about 2400 ft high from the sea level. Cloud of the sky often kisses the peak of the mountain. People can touch the cloud from the resort. Gentle breezes always blowing down the hill that makes a sweet sound deflecting in the mountain trees. At night the light of the moon, cloud and breeze creates an imaginary environment. 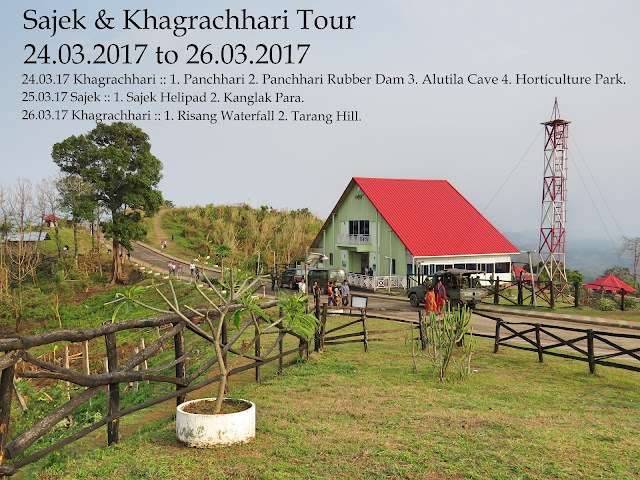 It is situated at Tigerpara, the nearest tourist spot from Bandarban. Nilachal is also known as Tiger Hill. It's about 5 km away from Bandarban and about 2000 feet above the sea level. It is a natural waterfall in Bangladesh. It is well famous in Bandarban. Shoilo Propat waterfall at Milanchari, 4 km from the Bandarban town following the road of Thanchi. Chimbuk hill is one of the highest mountains in Bangladesh. It is about 2500 feet high above sea level. Once upon a time it was one of the most famous tourist spot in Bandarban. Dhormo Sagar, Bangladesh Academy for Rural Development (BARD), Itakhola Mura, Rupban Mura etc. Sylhet is the Spiritual capital of Bangladesh. Also known as City of Saints because it's the home of Hazrat Shah Jalal (Rh) and Hazrat Shah Paran (Rh). It's the 4th largest city. It's a hub of the Tea industry and the center of the Bangladesh's oil and gas sector. Sylhet is also well known for it's natural beauty like rain-forest, waterfall, hills and river valleys. Adventure World Amusement Park, Bangladesh Tourism Corporation, Parjatan Motel etc. Lackatoorah Tea Estate: Lackatoorah Tea Company was established by Octivious Steel & Co. From 1934 to 1965 Managed by M/s McLain & Company of Calcutta. In 1972 – declared as abandoned Property and handed over to BTIMC. From 1st July 1978 the garden is under the management of NTC. Malnicherra Tea Estate: Maybe it's the largest and oldest existing tea garden in Bangladesh. Situated in 1854. Jaflong is a beautiful and attractive natural visiting place in Bangladesh. It's located at the border between Bangladesh and Meghalaya of India. Jaflong is the home of Khasia Tribe. It's also famous for it's rolling stone collections. The only swamp forest located in Bangladesh. It's a freshwater swamp forest located in Gowainghat, Sylhet. Khulna is the 3rd largest city having the 2nd sea port called Mongla. It's also the gateway of Sundarban. Sundarban is the largest tidal forest in the world. Shait Gombuz Masjid is known as Sixty Dome Mosque is the largest and the most traditional masjid in our country. Built in the year Khan Jahan Ali died, 1459. Shat Gombuj means 60 domes but there are actually 77 low domes over the main hall and one dome on each corner, bringing the 81 domes in total. There are exactly 60 stone pillars. The total length of the masjid is 160 ft and width is 108 ft. Around the Masjid there are three other single dome mosque called Bibi Begni Masjid, Chunakhola Masjid and Singara Masjid. A small museum has been established by the Directorate of Archaeology of Bangladesh, in collaboration with UNESCO, in front of the Shait Gumbaz Mosque, where antiquaries collected from the area of the historical site are displayed providing knowledge on the history of Bagerhat. Monihar Cinema Hall, Collectorate Building, Shiva Temple etc. Known as Montu Miyar Bagan Bari is one of the place that really astonish me. It's one of the largest private own resort. The largest private zoo and the first 3D zoo in Bangladesh. Barisal is well known for farming and fishing. Cress-crossed by lots of rivers. Rajshahi is called the Silk city. Bogra, one of the oldest towns in northern Bangladesh is the center of commerce and trade within the Bogra District. Bogra is located under the Rajshahi Division it is also a bridge between Rajshahi and Rangpur Division. Rangpur become the 7th division of Bangladesh in 25th, January, 2010. Kantanagar Temple a 18th century brick temple of hindus, situated in the village of Kantanagar, Sundarpur Union, Kaharole sub-district, about 26 km north of Dinajpur town across the Dhepa river. Nayabad masjid a 18th century brick mosque, situated in the village of Nayabad, Ramchandrapur Union, Kaharole sub-district, about 27 km south-west of Dinajpur town across the Dhepa river. This Rajbari had been constructed by Maharaja Prannath and his adopted son Maharaja Ramnath in the 18th century. The European, Muslim and Hindu architectural styles followed to construct this palace. According to the history about 1.5 million labors worked for it and the total expense was about 30,000 Taka in that period. The lake is about 1079 meter along north-south and 192.6 meter along east-west and approximate depth is 9.5 m.
Mymensingh One of the new division of Bangladesh, established on 12th January, 2015. Note: Each article I write, I add it here (site map).